Heartworm disease is serious and can be fatal for pets. 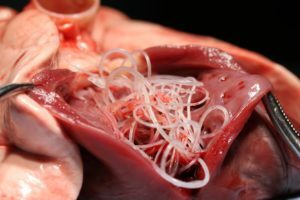 Heartworms are foot-long worms that live in the heart, lungs and blood vessels of infected pets. They cause lung disease, heart failure and other organ damage. Hearts worms affect pets, such as, dogs, cats, and ferrets but are also found in many other mammals. It’s rare for humans to have heartworms. Heartworms can thrive in dogs, where they mature into adult worms, mate, and produce offspring. If left untreated, dogs can have several hundred heart worms in their bodies. Heartworm disease can cause damage to a dog’s heart, lungs, and arteries. Prevention is the best option but you can treat dogs after they have heartworms. It’s harder for heartworms to thrive in cats but just a couple can cause severe problems. The medication used to treat infections in dogs can’t be sued in cats, so preventions is the only way to keep your cat safe from heartworms. How is the Disease Passed? Microscopic worms called microfilaria circulate in the bloodstreams of infected dogs, foxes, coyotes, and wolves. When a mosquitos can then pass these microfilaria to other animals who are susceptible to heartworms. After 6 months, the larvae can mature into adult heartworms and live in dogs for 5-7 years and 2-3 years in cats. In the early stages of heartworm disease there are no symptoms in dogs but as the worms mature into adults dogs will cough, act lethargic, lose their appetite, and lose weight. In later stages, dogs will develop heart failure and a swollen belly. Some dogs will have labored breathing, pale gums, and dark bloody urine. Untreated, most dogs will not survive. Symptoms can include coughing, asthma-like attacks, periodic vomiting, lack of appetite, or weight loss. Occasionally an affected cat may have difficulty walking, experience fainting or seizures, or suffer from a swollen belly. Unfortunately, the first sign in some cases is a sudden collapse or death. When Should Dogs and Cats Be Tested for Heartworms? All dogs should be tested annually for heartworm infection, and this can usually be done during a routine visit for preventive care. Annual testing is necessary, even when dogs are on heartworm prevention year-round, to ensure that the prevention program is working. Heartworm medications are highly effective, but dogs can still become infected if you miss just one dose of a monthly medication for any reason. The preferred method for screening cats includes the use of both an antigen and an antibody test. Your veterinarian may also use x-rays or ultrasound to look for heartworm infection. Cats should be tested before being put on prevention and re-tested as the veterinarian deems appropriate to document continued exposure and risk. Because there is no approved treatment for heartworm infection in cats, prevention is critical. 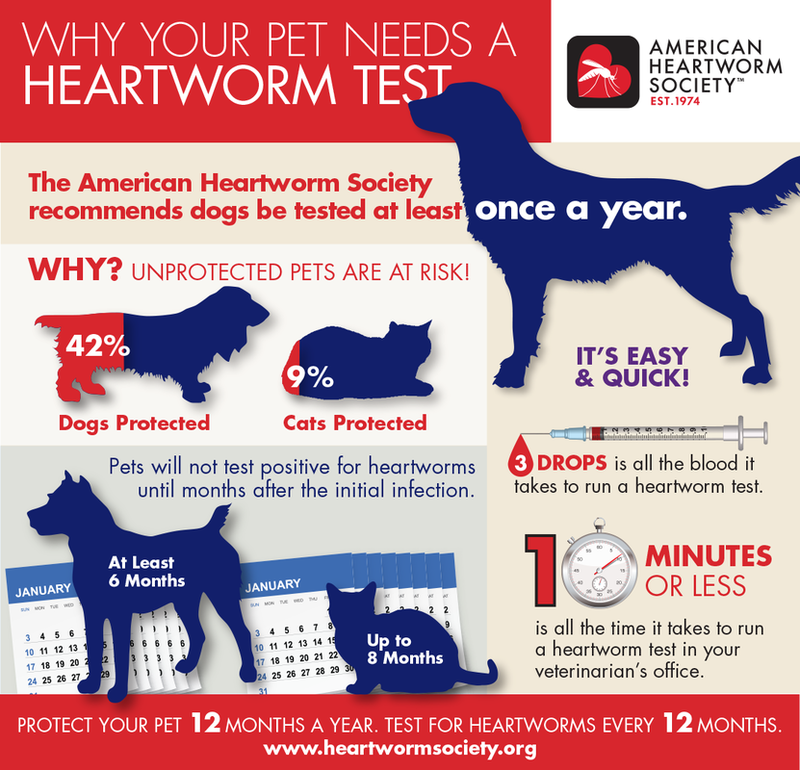 Contact us (513-831-3030) to learn more about heartworm disease!